The place to discuss all things Receiver. -Added fancy particle system to player to attempt to simulate particles you can see under sun shafts. -Limited the level generator to load one tile at a time for now. -Added a few fixes from the forums to make the game run faster. -[REMOVED]Visual Tiles now generate on both sides of the map to cover the empty sky. It was confusing, didn't look good, and seemed to take memory despite not generating any items or enemies. -[REMOVED]Changed the blank tape sound to have noticeable static. Anton pointed out that there is noticeable noise on the clear tape. 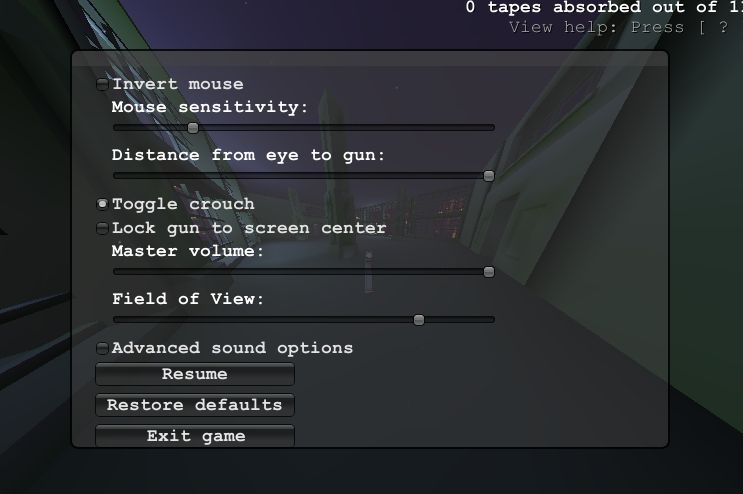 -FOV is now configurable. It's at 100 by default. At the moment not too impressive especially since I mostly made it for me. Last edited by Enemby on Sun May 12, 2013 5:19 pm, edited 2 times in total. Any chance you can instead an FOV slider to the pause menu? .::Taboo::. wrote: Any chance you can instead an FOV slider to the pause menu? Done! It was actually pretty easy to do that, but I ended up tweaking some menu functions while I was doing it. Awesome! It would be nice if you could extend the menu by a bit, there isn't much space. Otherwise, awesome work! TehEpic wrote: Awesome! It would be nice if you could extend the menu by a bit, there isn't much space. Otherwise, awesome work! The menu by default will add a scroll bar if all of the area on it is used, so it shouldn't be a problem. I've given you frighteningly little to base that opinion off of. That would actually be, very, very easy. At the moment Receiver just loads a 'win' scene when all 10 tapes are absorbed, which could be easily changed. No comment on that for the moment though. Gameplay first. Ooh. I like what I'm seeing so far. This game could really shine with a little extra polish and that sounds like what you're aiming to do. would it be a stupid idea to change all the tapes into different songs or types of music? Could you give some information about what i need to mod Receiver? I tried searching the forum but couldn't find any information. My day job is delphi/c# developer and would like to try and see how the game was build through the source. Which programs do i need, or do you use for modding? Can you compile the complete game or do you need some kind of paid unity engine license for that? liampieman wrote: would it be a stupid idea to change all the tapes into different songs or types of music? That certainly would be quite the mod. If every tape was a part of Heyeyeyeyeye I would be far more motivated to play properly. I guess that would fall under the purview of your conundrum of philosophy. Game-wise though, you'd be in audio hell unless you disabled the music. Thanks for the information. I kept trying to open the SLN file in Visual Studio. Already had Unity installed but couldn't get it to open the solution. Felt pretty stupid when i just saw that it wants to open a folder instead of the solution file No wonder i couldn't get it to open anything.